Today I would like to talk about yet another unique embroidery tradition of the Dnister corridor, This river separates the historic districts of Pokuttia and Podillia. 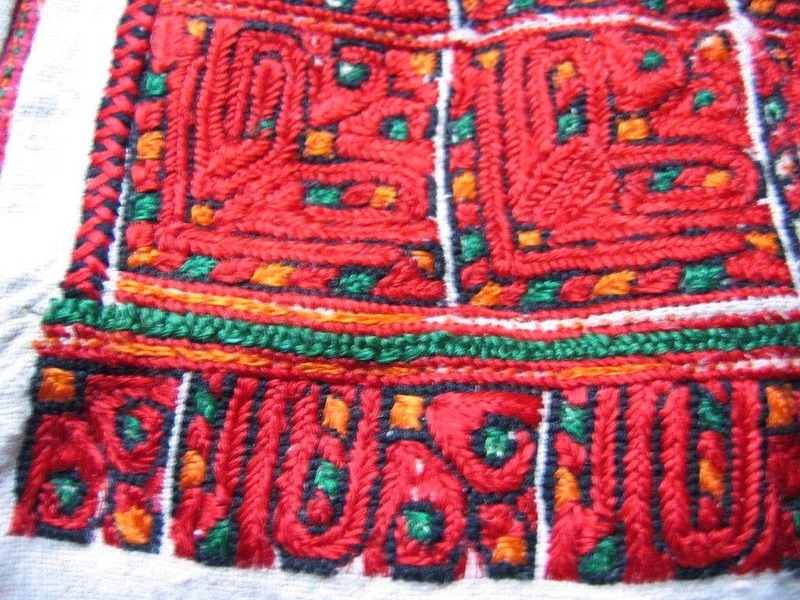 This region is incredibly rich in embroidery techniques. This technique is mostly known for being used on the ends of the ancient woman's headpiece, the peremitka, which is a long narrow piece of linen which is wound around the head and neck of married women. The ends of this garment were always decorated either with a woven design or with embroidery. These ornemented ends were called 'zabir'. 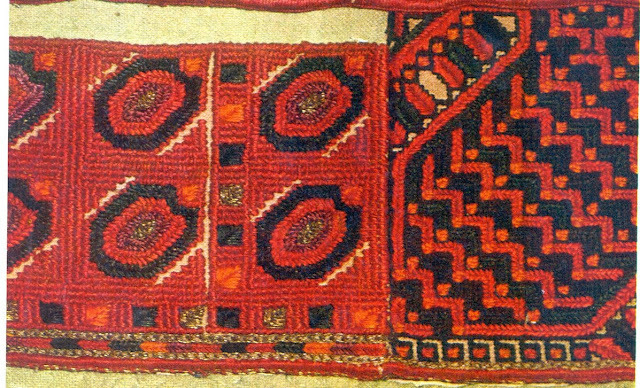 The edges were sometimes also ornamented, usually with simple woven designs. Here are some women in Horoden'ka district costume wearing peremitky. This type of embroidery was used on women's chemises as well, but lasted longest on the zabory because it could be made to look almost the same on both sides. The image at the top of the article is a good example of this technique, even though the photo is somewhat washed out. I will be using several images which are of rather poor quality, and i apologize that i was not able to find better. 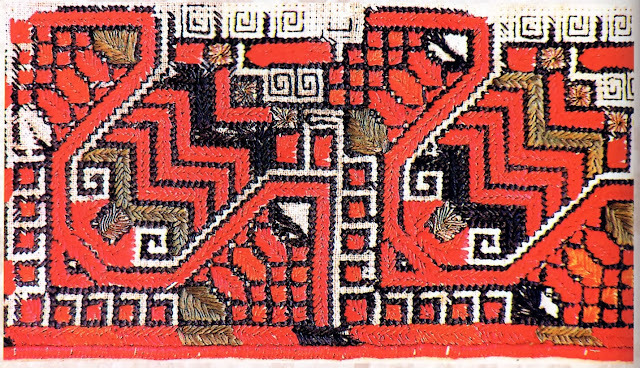 The framework for these designs was laid out in black cross stich, or sometimes stem stich. 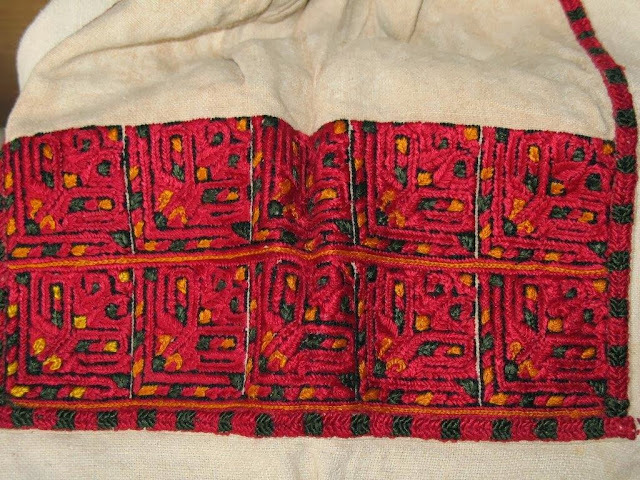 For the zabir, double sided cross stitch was used. 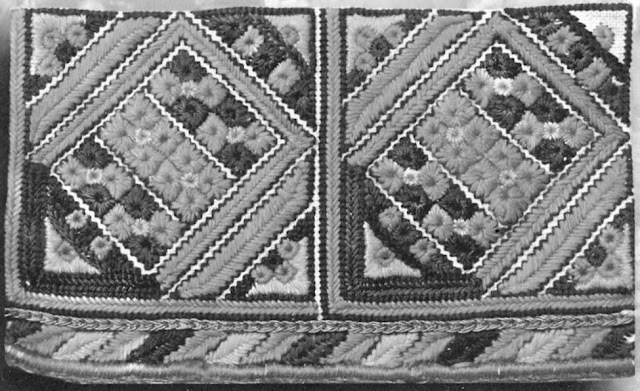 Then colors were filled in with a herringbone or pine type stitch, which started from the center line of the outlined area and extended diagonally to the outer edge. This was often executed in silk thread, and sometimes in metallic thread as an accent..Some of the outlines, and often decorative elements on the edge of the design were done with Holbein stitch.Other stitches were used for the edging, including buttonhole and chain stitch. Elements which are equilateral end up looking almost like eyelets, but they are not pulled open. 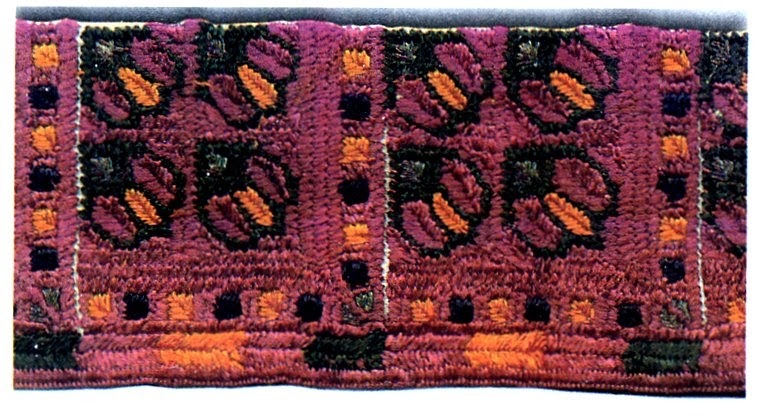 The primary colors used are dark reds, edging into maroon and purple with other colors used as accents. 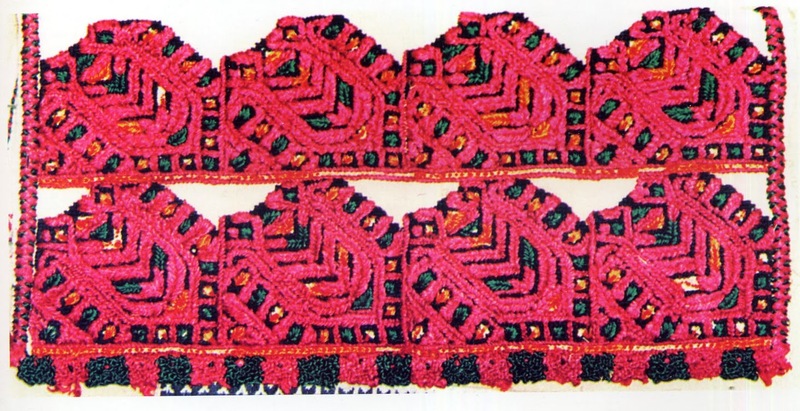 Some designs use stem stitch instead of cross stitch, and are curvilinear. The filling is done in the same way however. Many designs are symmetrical about the diagonal axis, which is similar to embroidery designs in the Balkans. 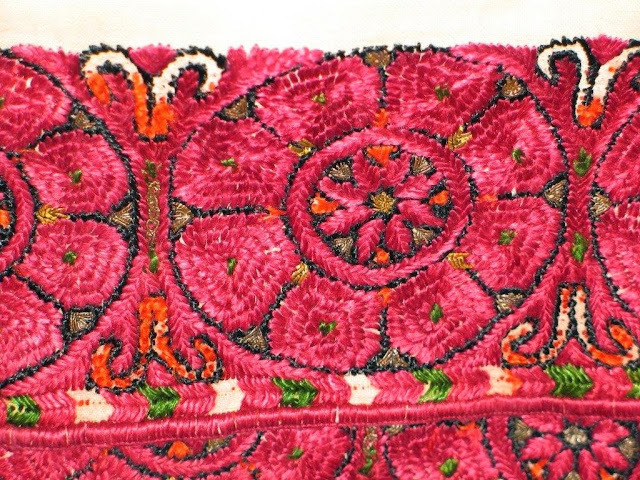 And of course, wherever creative embroiderers existed, variations on the technique also existed. 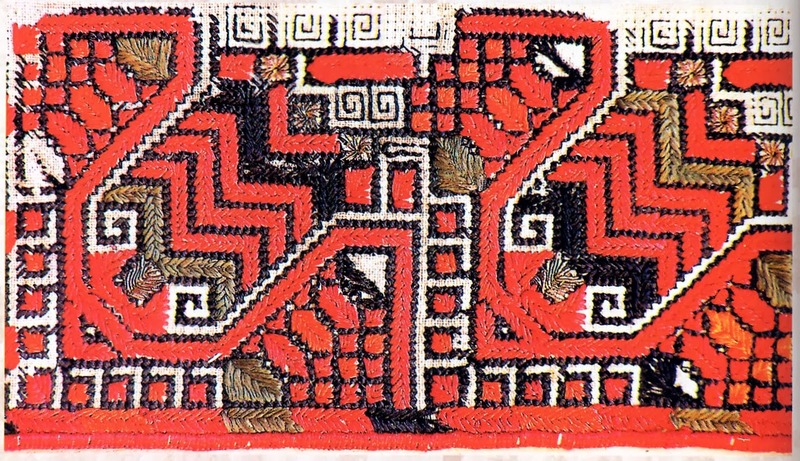 More recently, this technique, as with so many others, was imitated with cross-stitch. Here are two shoulder insets from women's chemises with the same design, one done in rozchokhy, and the other in cross stitch. And another pair, from zabory. 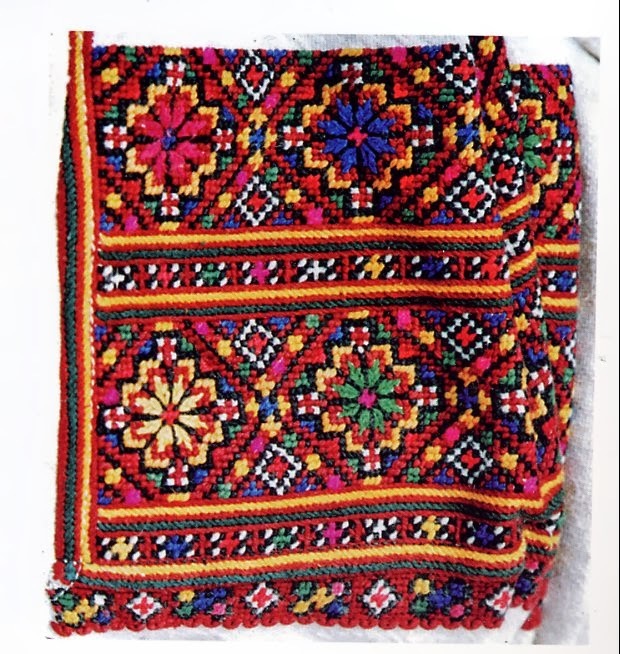 In fact, it is my belief that many designs in this area with strong black outlines of individual motifs which are today only found in cross stitch were originally executed in rozchokha. It would be interesting to reverse engineer these designs. I suppose I should mention that some of these designs were deliberately left unfinished so as to more clearly show the structure. 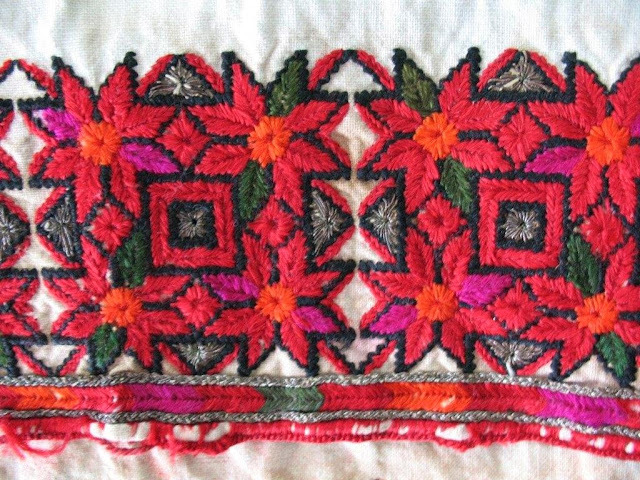 Occasionally you will see a remnant of rozchokha in a cross stitch design. 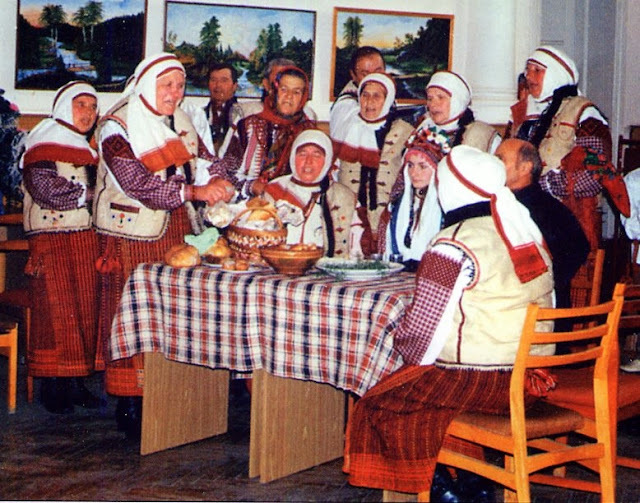 This technique has today been revived, and is being taught in places like the Uchylyshche in L'viw. New designs using the technique are also being invented. I had such a piece in my personal collection, but it was borrowed and never returned. This is a beautiful part of the creative heritage of Ukraine and the world, and I would encourage you to try it. This technique has a great deal of potential. Thank you for reading. I will close with some more images of pieces done in this technique. Hello, Roman. Thanks for this post! 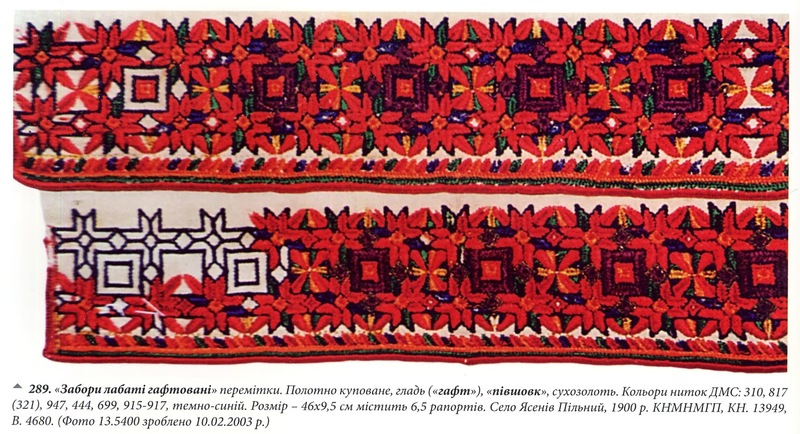 I thought, that on Pokuttya peremitkas was mainly woven (like this from Jaseniv-Pilny http://hutsul.museum/collection/77/341/ ), but your post opened my eyes to the wonderful local version of embroidered peremitkas. I don't have the 3rd Iryna Svyontek's book, so I ask you, is there in the book how to do this embroidery? By the way, "some women in Horoden'ka district costume wearing peremitky" are the folk band "Peremitka" from village Luka, Horodenka raion and you can watch their performance on youtube http://youtu.be/YT6eFkwiKBE . Thank you, Nawko, I would like to know where I could find her other two books. I have not found them available here. 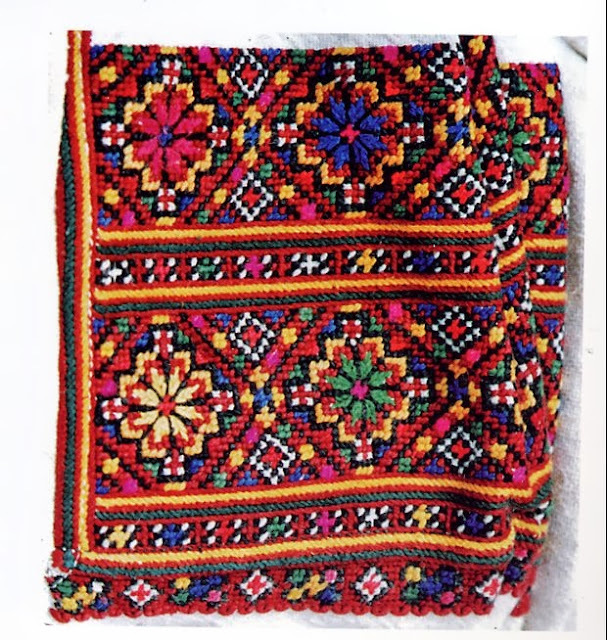 She does not show how to do this embroidery, but you can save and enlarge the black and white images and be able to see how it is done.It is pretty obvious.framework in cross stitch and outline stitch, filling with herringbone or sosnytsia. 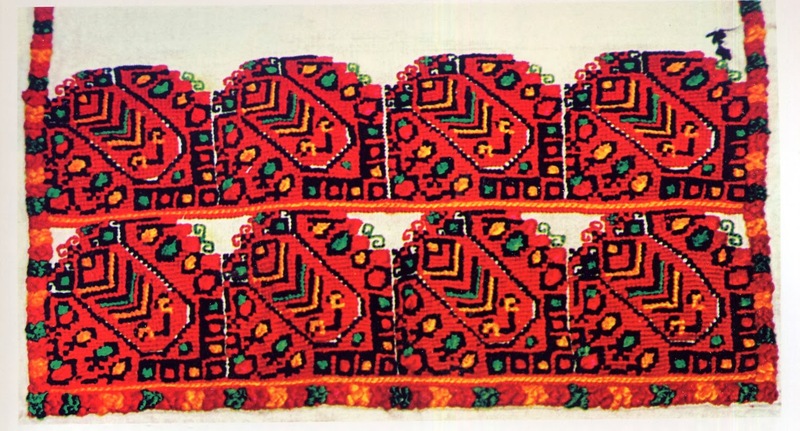 Most books on Ukrainian embroidery cover this, for example the one by Diakiw O neil. 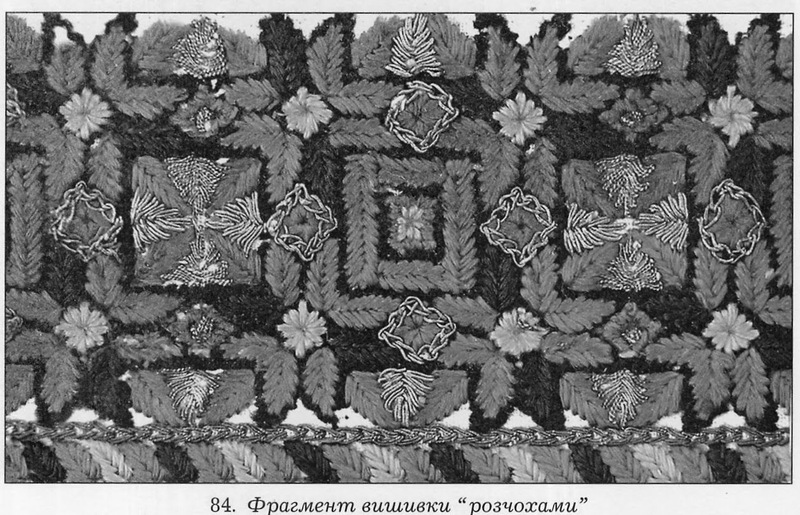 It is called plait stitch, or peremitkovy show or Horodenkovy stib, or somesuch. There is a description, if no diagrams in 'Podil'ska Narodna Vyshywka by Liudmyla Bulhakova-Sytnyk. Thank you for your information. and please let me know how i could buy her other two books. Перші 3 присвячені Гуцульщині, одну з них я маю книжкою (2-гу)(поталанило, привезли з Івано-Франківська), іншу - найстаршу - скановану копію в форматі djvu. В Києві їх не видно у продажу, і не видно в інтернет-магазинах. Ті, що я бачила, - то зібрання чорно-білих схем низинкових розводів (переважно). Нагадують книжку Є. Сороханюк, але на жаль, гіршої якості. Ви маєте знати, що поліграфічна якість книжок пані Свйонтек покращувалась з кожним виданням і та, що Ви маєте - найкраща, а давніші трохи поступаються. Я знайшла видавництво, що видало дві з трьох книжок, це "Нова Зоря", Івано-Франківськ http://novazorya.if.ua/books?start=4 З ними можна сконтактувати електронною поштою nz@com.if.ua. Також, ймовірно, усі книжки є у авторки, але її контактів я нажаль не маю. І ще один коментар українською, бо усе, що я хочу, моя погана англійська не дозволить написати :) (сподіваюсь, Ви мене зрозумієте). Можливо, коли матимете час, Вас зацікавить тема, над якою зараз думаю я. Це білі вишивки Житомирщини. (Баранівський район, с. Суємці та навколишні) Я наполегливо шукаю книги і статті, де б виділяли цю вишивку, але поки що марно. Єдине джерело, що містить замальовки - "Український народний орнамент" Олени Пчілки, 1876 (починаючи з 8 аркуша). Завдяки вишивальниці Тетяні Серебренниковій можемо переглядати це видання онлайн тут http://vyshyvanka.ucoz.ru/forum/57-896-1. Цей альбом містить зразки орнаментів з Новоград-Волинського повіту, до якого Баранівський район належав, але не містить конкретики щодо місць побутування кожного окремого узору і також мість дуже загальний опис вишивки вирізуванням і настилуванням без виділення якихось локальних рис. Усе інше, що вдалось знайти - це фото вишивок в Мережі. Велику підбірку відфотографувала у фондах музею Гончара пані Олена Уткіна. Її фото можна знайти в альбомі іншої вишивальниці, пані Лідії Бебешко, яка перетворює їх в PM-схеми: https://www.facebook.com/media/set/?set=a.440060966119345.1073741847.116152611843517&type=3 . Усі інші зразки, що мені вдалось знайти, я зібрала на дошку в Pinterest: http://www.pinterest.com/podillyaforestm/zhytomyr-style-of-ukrainian-cutwork-embroidery-vyr/ (звідти можна потрапити на першоджерела, якщо то не були соціальні медіа). Ось і все. Pereproshuju shcho i vam vidpyshu latinikamy. Je chudovi znymky v knyshchi 'Vyshywka Skhidnoho Podillia', pysaly Jevhen i Tetiana Prychepi, z vydawnytsa 'Rodovid'. Так, звичайно, я читала Ваші статті. Але тут мене зацікавило Житомирське біле шитво, як оремий різновид українських вишивок білим по білому. На скільки я бачу воно якраз мало схоже на вінницьке і снятинське, а більше схоже на полтавське, хоча має ряд особливостей, які якраз я перераховувала пунктиками :), хоча мало б бути більше схоже на рівненське (сарненський район), бо туди ближче. Перепрошую за турботу. Vy majete na uvazi Podil'ske vyrizuvannia. Tak, ja maju kil'ky fotohrafii o tseho takozh. Mih by vam posylaty jakscho meni daiete adress na email. Interesting and exhaustive articles here,thank you! A very modern view of things you have. 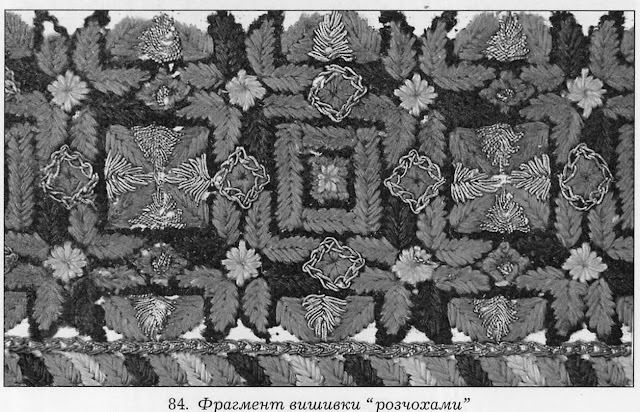 Embroidery in Ukraine as in many other places was considered to be essential. It was, and to some extent still is, a visible mark of your good taste, how marriageable you are, and evidence of proper householding skills. Untill about the 1930's, all the cloth and thread for embroidered items were made at home, by hand. Today we pay exorbitant prices for good linen, but in those days, it was much more available. Even when commercial thread began to be used, it was never that expensive. Secondly, these clothes were not worn for a season and then discarded, as we unfortunately do today. Linen is extremely durable, and an embroidered garment could be worn for decades. This is especially true for the most extensively embroidered garments which were only worn for important occasions, or perhaps for church on Sunday, at most. 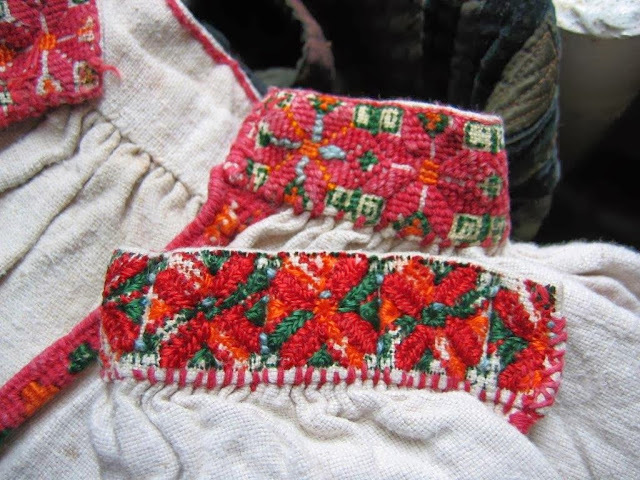 Everyday clothes would eventually wear out, and had less embroidery, but even then would be recycled as footcloths, baby swaddling and the like. This was not much done by city women untill the 1930's when it became fashionable to have an ethnic identity. The woman in the villages worked on the family farm, and for much of the year agricultural work does leave one with a great deal of free time, excepting only planting time and harvest. 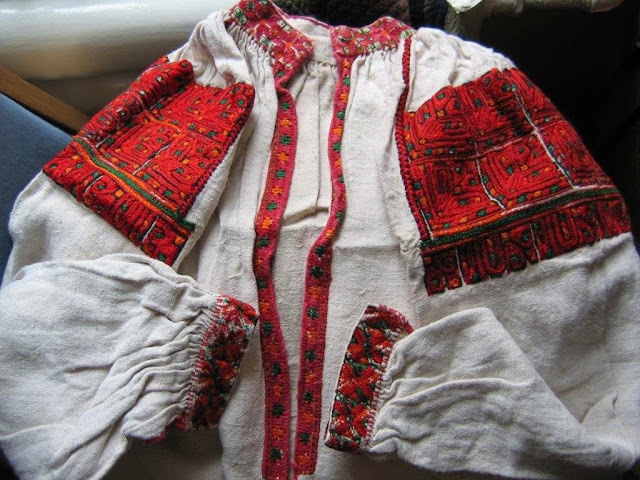 Also, one of the most important things that young girls were expected to do was to prepare their trousseau; A girl was not considered to be ready for marriage untill she had a proper collection of embroidered clothes and household linens prepared, often including a shirt for her future spouse. 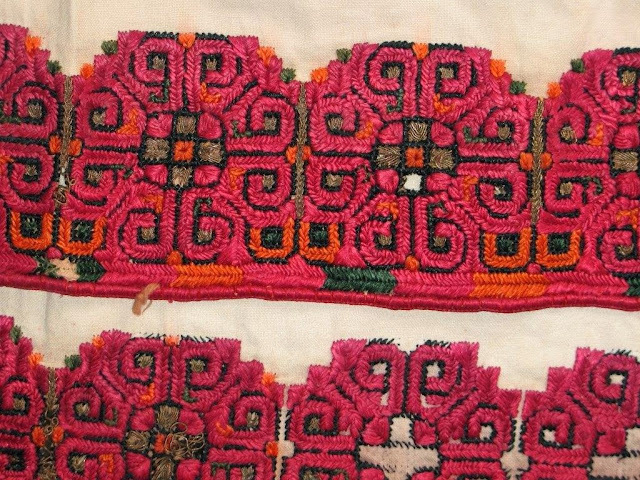 Women would also embroider shirts for their husbands and sons. 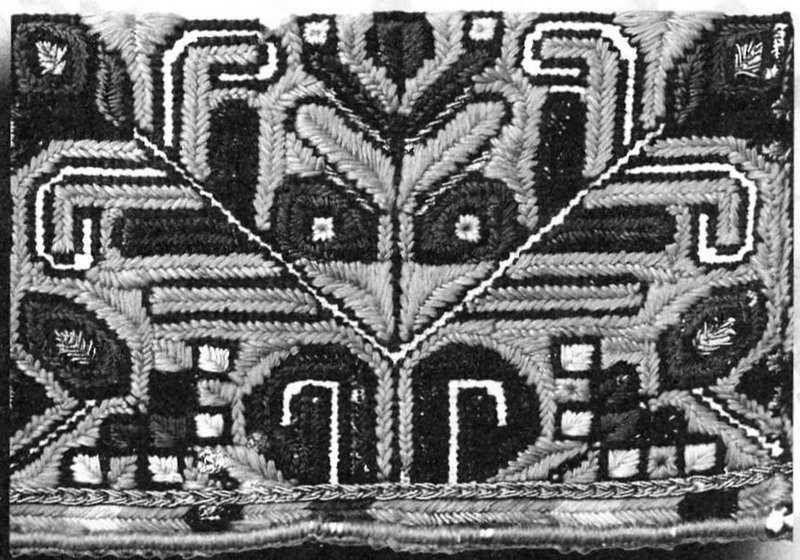 It was considered to be an extremely strong protective talisman for a young man to go out into the world with a shirt embroidered by his mother. 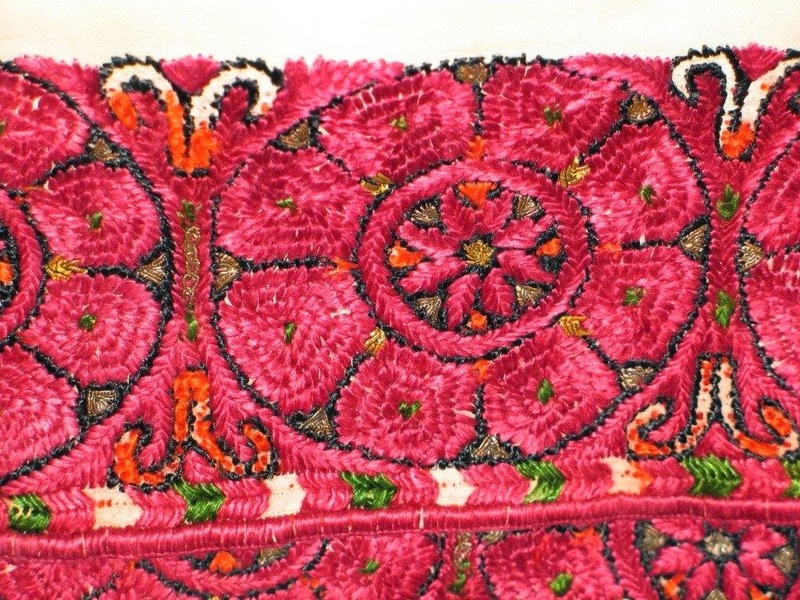 Embroidery was never considered to be just 'a hobby', it formed a vital part of life. This has not completely been lost in Ukrainian culture even today. And of course, all of this applies to many other peoples as well. Ohh,thank you, Roman; very informative. Hi.. Great post. Well you have discussed here few things about Costume & Embroidery and your images also looks amazing. Keep this type of posting.